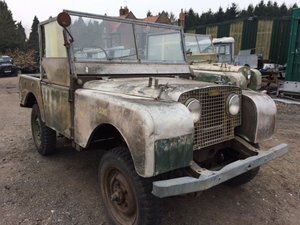 For sale through AB 4x4s and on behalf of a customer is a lovely Land Rover Series 1 1953 (very early 86") Our customer liked this car so much he bought it twice. He sold it to a friend then later bought it back. It has been subject to a recent restoration and this is very evident. A large folder of receipt amount to many thousands only in the recent years. Also mots dating back to the early 70's. Some of these items are listed below- new hood New sticks New seats New wiring loom New tyres Shotblasted wheels New rear bench seats Expensive restored steering wheel by Charlesworth & sons freewheeling hubs Reconditioned Tex Magna indicator stalk Period wing mirrors All in all this is a superb example that is ready to enjoy whilst increasing in value day by day. Please contact Anthony on 07947608966. We can deliver worldwide.